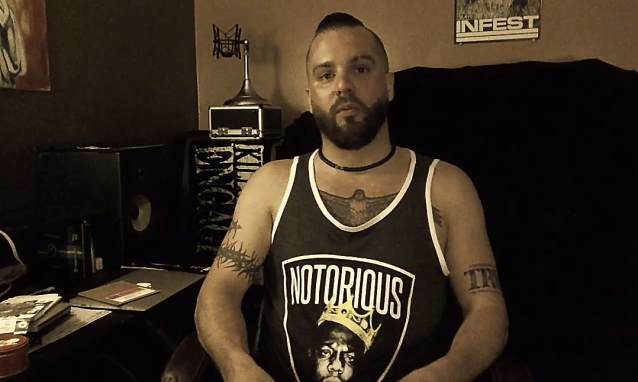 Vocalist Jesse Leach of Massachusetts metallers KILLSWITCH ENGAGE recently answered 10 more fan-submitted questions via his official YouTube channel. Check out the resulting 11-minute clip below. According to The Pulse Of Radio, Leach opened up in a recent interview with Metal Hammer about the reasons why he originally left the band in 2002 after recording two albums. Leach, who reunited with the group in 2012, explained, "When I left KILLSWITCH, there was definitely something wrong with my head. I was dealing with a depression. At that time it was a pretty lowdown feeling of being alienated, just sort of not being prepared mentally for a life on the road." Leach told The Pulse Of Radio recently that since rejoining the band, touring has been much easier for him. "It isn't hard," he said. "It's fun. It's great. I'm excited to do it. And even the days when we're stuck, you know, in a parking lot somewhere with nothing to do, like, I'm still amused by being on a tour bus with these guys and, you know, we just have fun together. It's great. The vibe on the bus is great. It's family style, like, all around it's good stuff. Everything's sort of in its right place right now, so no complaints." Leach also revealed that during his first stint with the group he did not know how to properly care for his voice on tour, saying, "I was struggling to maintain it. I wasn’t hanging out with the band because I was just so worried about conserving the voice I had. I wasn’t drinking, I just wasn’t participating in any of the fun aspects of being out on tour." The vocalist added that he "just ended up driving my head into some really dark places to the point where I was apathetic to what I was doing . . . it's laughable to me now when I look at myself then and consider the person I've become." Leach's replacement in the group, Howard Jones, sang with them for nine years and three albums before leaving in 2012 with his own health issues. Leach's comeback album and the band's sixth studio effort, "Disarm The Descent", sold around 48,000 copies in its first week of release to debut at No. 7 on the Billboard album chart in April 2013. The group earned a "Best Hard Rock/Metal Performance" nomination at the Grammy Awards for the song "In Due Time".